June 19, 2011 Angela G.
I get it fairly, but I am a hot dog junkie. I’m talking Tyrone Biggums crackhead junkie for a hot dog. I love footlongs, Hebrew Nationals, burnt Oscar Meyers around the campfire, red onion laden Grays Papayas, ASU’s Dave’s Dog House with the buttered buns, a charbroiled and blistered dog from Ted’s and a Ben’s Chili Bowl half smoke. I love them equally and unabashedly. Even the dirty water dog has a special place in my heart. So of course, after moving out to the wild, wild west, it was only a matter of time until I discovered the joys of the infamous Sonoran dog. 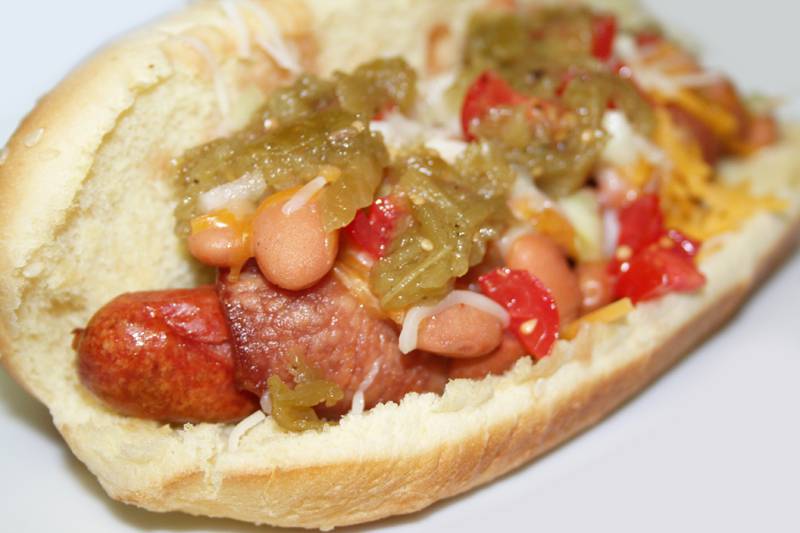 The dog hails from the Mexico/Arizona border, and features a bacon-wrapped link that is grilled and then topped with a bevy of condiments. We’re talking pinto beans, shredded cheese, tomatillo and jalapeno salsa, chopped tomato and diced onion to name a few. Traditionally, these bad boys are served on a sturdy Mexican roll with ketchup, mayo and mustard, but you can choose your toppings according to how you like them and use whatever roll you’d like to get the job done. I like a sesame-seed hero roll myself. Although crisping this bad boy up is great on the grill, you can use a rack over a cookie sheet under your oven’s broiler if you are grill-less. I like to use a natural casing dog as my first choice, and a snappy Nathan’s brand or Sabrett’s brand dog as my second choice, since they cook up so love-er-lee. But again, with a dog with this much DIY potential, feel free to rock it the way you want it. Just make sure it’s loaded up, because that is the name of the game. Begin by wrapping each hot dog with a strip of bacon. Cook hot dog on the grill until bacon is crispy and browned on both sides. Alternatively, you can place a rack over a cookie sheet and cook under your broiler for 7-10 minutes per side. While the hot dogs are cooking, warm your beans. Add your beans to a small saucepan with the adobo seasoning, chili powder and olive oil. Taste for salt and season. To assemble, squirt bun with a little ketchup, mustard and mayo (if you’d like it). Top with the hot dog and spoon a few tablespoons of beans on top. Sprinkle cheese over the beans to melt and then top with tomatoes, onions and tomatillo salsa. Eat quickly and blissfully before the whole thing falls apart. This recipe is decidedly a hack – upon researching recipes for Thanksgiving, I came across a stuffing that looked to be a welcomed alternative to my tried and true Classic Stuffing. Given that this year’s celebration was a pot luck extravaganza, why not two stuffings instead of one? Truthfully, I wanted to do a third Oyster Dressing like the ones we used to have at my paternal grandmother’s house every year, but not enough people were into oysters, so I skipped it. The original recipe from Food Network Kitchens is good, but I lost the leeks and butternut squash for caramelized red onions and canned pumpkin – MUCH easier, which is really what you are going for at Thanksgiving. The result was moist, flavorful and complex – a nice accompaniment to turkey and gravy, if I might say so myself. Give this one a try if you are looking to make a new tradition or two – how can you form a tradition if you don’t try something out for the first time, right? Right?!? Cube foccacia and spread on a cookie sheet. Bake in a 350° oven until crisp and golden, about 10 minutes. Remove from oven and set aside. In a bowl, whisk the eggs. Add the white pepper, sage, fennel seeds, pumpkin and chicken stock and mix until incorporated. Set aside. In a skillet, brown the sausage and remove with a slotted spoon. Add the olive oil and sauté the kale until wilted. Remove with a slotted spoon and add to sausage. Add the butter to the pan and turn the heat to medium low. Let the onions sweat it out in the pan until dark brown and soft, about 10 minutes. 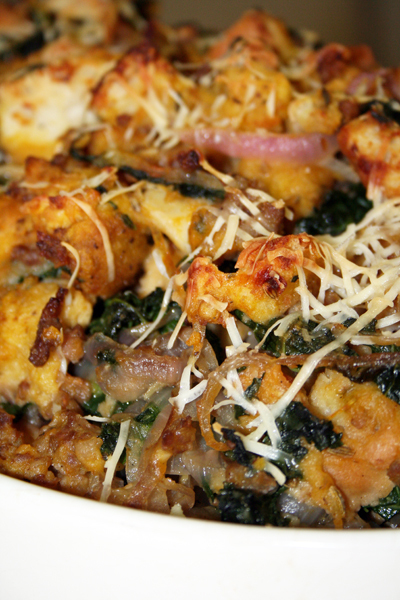 In a huge bowl, add the foccacia cubes, sausage and kale, and caramelized onions. Toss to combine and then pour in the pumpkin mixture. Turn out into a greased 13x9x2 casserole and bake in a 375° oven until puffy and golden on top, about 35-45 minutes. I really love making shish kebab – it’s always praised effusively when made for friends and that pay off comes with very little work. Buy a bunch of veggies and a little meat, let them hang in some herbs and spices, thread on skewers, grill or broil and call it a day. This marinade could not be any easier, and best of all, is made with such common pantry staples, you don’t have to do any special shopping ahead of time to get this one on the table. The best part is that you can absolutely do what you like when making this – if you prefer red meat to chicken, substitute cubes of beef tenderloin or tender lamb. Like seafood better? 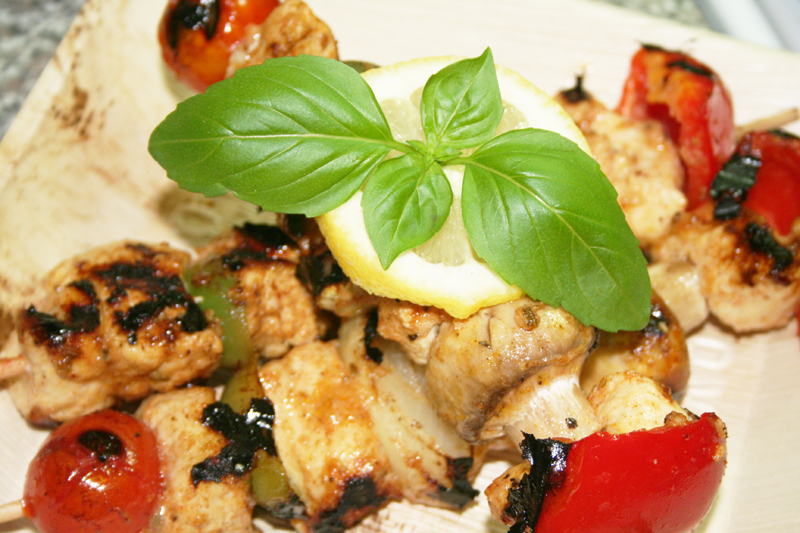 Try this recipe with cubes of swordfish threaded on skewers, separated by bay leaves instead of the vegetables. It makes a hearty, savory alternative to the traditional red meat or chicken. And of course, you can bypass the meat altogether and just go with the veggies alone. Use whatever assortment of vegetables that look the best in the grocery, or are on hand in your fridge – eggplant and squash also make excellent additions. It’s all good! Serve these gems with a squeeze of lemon and a side of fluffy rice or pita. No fuss, no muss and people will swoon for the fresh preparation and bright ingredients. It’s such a winner, you’ve just gotta try it. Cut chicken into 1 inch cubes and place in a tupperware. On a clean cutting board, loosely chop garlic and then sprinkle the kosher salt on top. Using the blade of your knife, drag it across the garlic to mash it into the salt, forming a paste. Add garlic paste to chicken, along with the olive oil, garlic powder, onion powder, paprika, black pepper, lemon zest and lemon juice. Stir well and place in the fridge to marinate for at least 30 minutes and up to 24 hours. Remove chicken from fridge and let rest on the counter while you prep the veggies. Clean mushrooms with a damp paper towel and place in a bowl. Add your cherry tomatoes to the bowl. Cut red and green pepper into 1 inch chunks and add to the mushrooms. Next, cut onion into 1 inch chunks, making sure to keep the slices of onion together as best you can. Set aside, separate from the mushrooms, peppers and tomatoes. In the veggie bowl, add the lemon zest, olive oil, black pepper and salt. Toss to combine flavors. Get out some skewers – if you are using bamboo skewers, make sure to soak them in water first to prevent them from burning. Thread the chicken and vegetables onto the skewers, alternating between meat and veggies. Place skewers on a tray to hang out while you continue to assemble the shish kebab. Lightly grease a grill or a grill pan with canola oil or Pam for grilling and heat to smoking. Turn heat down to medium and cook kebabs until veggies are charred and chicken is cooked through, about 10 minutes per side. Serve.